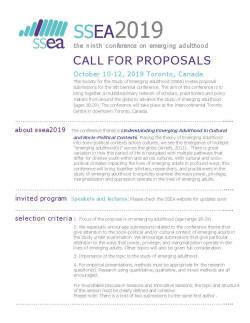 The Society for the Study of Emerging Adulthood (SSEA) invites proposal submissions for the 9th biennial conference. The aim of this conference is to bring together a multidisciplinary network of scholars, practitioners and policy makers from around the globe to advance the study of emerging adulthood (ages 18-29). The conference will take place at the Intercontinental Toronto Centre in downtown Toronto, Canada. Download the CALL FOR PROPOSALS here and look for updates on the conference website. The Society for the Study of Emerging Adulthood (SSEA) invites proposals for a conference on a specified theme, to be held in 2020 or 2022. The main biennial SSEA meetings are held in odd-numbered years, with the next one to be held in Toronto on October 10-12, 2019. The first thematic conference, on Self and Identity Development in Emerging Adulthood, was held in Cluj-Napoca, Romania, in April, 2018 and was highly successful (see http://ssea.org/conference/Identity/index.htm for a summary). Consequently, SSEA will offer another thematic conference in 2020 and/or in 2022. The deadline for submitting proposals is December 15, 2018. Proposals should be submitted to SSEA President-Elect Larry Nelson, larry_nelson@byu.edu. Questions and inquiries should also be directed to Dr. Nelson. The association between identity and trauma is a complicated one that requires greater study. While traumatic exposure and adverse life experiences can be disruptive to identity development in adolescence, identity can shape the manner in which such experiences are perceived and understood. Identity can both exacerbate posttraumatic stress disorder symptom severity, and promote positive posttraumatic growth. Trauma can be incorporated into one’s identity, serving as not only a turning or reference point, but also the inspiration for one’s purpose and life goals. The intent of this special issue is to explore current notions of the ways in which identity and trauma are mutually influential. Our goal is to present a collection of papers that can inform prevention and intervention efforts geared toward reducing the negative effects of adverse life experiences, and increasing the positive growth that can come from such exposure. We invite submissions of all types, including those quantitative, qualitative, mixed-method, or theoretical in nature. This Special Issue will have a two-tier review process. Preliminary abstracts (limit 500 words) will be due November 1st, 2018 for feedback and guidance. Full manuscripts will due by February 15th, 2019. President's Message; Topic Network Updates; Emerging Adulthood Article Spotlight; and more. Please see here for the full newsletter. The current volume presents new empirical data on well-being of youth and emerging adults from a global international perspective. Its outstanding features are the focus on vast geographical regions (e.g., Europe, Asia, Africa, North and South America), and on strengths and resources for optimal well-being. The international and multidisciplinary contributions address the complexities of young people's life in a variety of cultural settings to explore how key developmental processes such as identity, religiosity and optimism, social networks, and social interaction in families and society at large promote optimal and successful adaptation. The volume draws on core theoretical models of human development to highlight the applicability of these frameworks to culturally diverse youth and emerging adults as well as universalities and cultural specifics in optimal outcomes. With its innovative and cutting-edge approaches to cultural, theoretical and methodological issues, the book offers up-to-date evidence and insights for researchers, practitioners and policy makers in the fields of cross-cultural psychology, developmental science, human development, sociology, and social work. more information about this series here. Sign-up to receive notices and announcements for the 7th Conference on Emerging Adulthood. Emerging Adulthood (EA) is an interdisciplinary and international journal for advancements in theory, methodology, and empirical research on development and adaptation during the late teens and twenties. Learn more and get details submitting manuscripts.